Sgt. Gene Robert Brandes Jr. Hometown: Oak Ridge, New Jersey. Unit: 4th Battalion, 5th Air Defense Artillery Regiment, 69th Air Defense Artillery Brigade, Fort Hood. Sgt. Gene Robert Brandes, Jr., 28, of Oak Ridge, NJ., passed away on Tuesday, May 27, 2014. He was born on June 11, 1985 in Dover, NJ., to Kathryn Sue (nee Maupin) Brandes and Gene Brandes, Sr., and was raised in Jefferson Township along with his two sisters. Sgt. Brandes joined the US Army in August 2006 as a Food Operations Specialist (92G). His first duty station was Fort Hood, Texas and deployed in support of Operation Iraqi freedom from August 2007 to November 2008. Sgt. 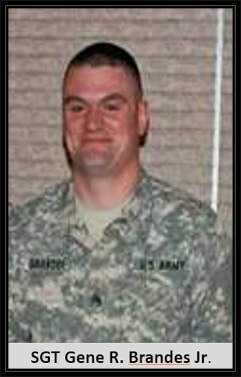 Brandes was then assigned to Fort Drum, New York, from February 2010 to 2013. While assigned to the 10th Mountain Division, he deployed to Afghanistan in support of Operation Enduring Freedom from April 2010 to March 2011. In 2013, Sgt. Brandes made a career transition and trained to be an Avenger Crew Member (14S). Upon completing his training in Fort Sill, Oklahoma, he was assigned to Echo Battery, 1st Battalion, 44th Air Defense Artillery, Fort Hood, Texas in June 2013, where he served as a Team Leader. In April 2014, Sgt Brandes transitioned again to be a Patriot Launcher Operator / Maintainer (14T) and was assigned to Delta Battery, 4th Battalion, 5th Air Defense Artillery. Sgt. Brandes' military education includes Combatives Level 1 course, Combat Life Saver's course and Warrior Leader's Course. His military awards include the Army Commendation Medal 3OLC, Army Achievement Medal 3OLC, Meritorious Unit Citation, Army Good Conduct Medal1OLC, National Defense Service Medal, Afghanistan Campaign Medal, Iraq Campaign Medal, Global War on Terrorism Service Medal, Noncommissioned Officer Professional Development Ribbon, Army Service Ribbon, Overseas Service Ribbon with a number 2 device, NATO Medal, and the Army Certificate of Achievement (2). Sgt. Brandes was currently stationed in Fort Hood, Texas where he was promoted one year ago to his current rank of Sergeant and was most recently awarded the Military Volunteer of the Year. Gene Robert will best be remembered for his love and enjoyment of art and music and his devotion to his family, especially to his daughter Lilli. Gene Robert was predeceased by his dear uncle Chuck Martyn in 2011, his Grandma Thersa Brandes, his Grandpa Brandes, and his cousin Brad Martyn in 2001. Gene Robert is survived by his cherished daughter Lillian Krimson Sue Brandes; his beloved parents Kathryn Sue and Gene Brandes,Sr; his loving sisters Sarvataa Mae Christie in PA, and Melissa Ann Brandes in Dover, NJ; his aunt Dossy Maupin of Florida; his uncle Steve Maupin of Oak Ridge, his aunt Barbara Brown and her husband Bob of PA; his uncle Walter Brandes and his wife Margaret; his nieces Emily Glenn Ritchie, Skyla Mae Giles, and Sage Marie Williams; his Godparents Lynne and Bob Heiner of Oak Ridge, NJ; and his best friend Doug Komoroski of Oak Ridge. The family will receive visitors on Sunday, June 8, 2014 from 2-4pm and 7-9pm at the Stickle-Soltesz Funeral Home, 187 LaRue Road, Newfoundland, NJ 07435 (GPS use 1 Post Place). The funeral service will take place on Monday, June 9, 2014 at 10:30am at the Milton United Methodist Church, 316 Dover Milton Road, Milton, NJ 07438. The interment will follow at The Oak Ridge Presbyterian Cemetery, in Oak Ridge, NJ. In addition to flowers memorial donations may be made in Gene Robert's name to: Wounded Warrior Project, P.O. Box 758517, Topeka, Kansas 66675. Log onto www.sticklesolteszfuneralhome tribute wall to personally post your condolences, memories, photos, and videos, as well as obtaining driving directions to the funeral home. - See more at: http://www.legacy.com/obituaries/dailyrecord/obituary.aspx?pid=171255947#sthash.lqWXTf6j.dpuf.